Distribution: New World tropics. Central and northern South America. Panama to Ecuador and to the mouth of the Amazon. Skin/Color/Coat: Small, usually colourful and quite slender. Species at Toronto Zoo is black with emerald green patches. Reproduction and Development: After the eggs are laid, the male fertilizes them and carries them on his back. There they eventually hatch, without immersion in water, except for rain. The young number 2 to 20. The larvae gain a hold on the male's back from mucus secreted by the male. The young feed from the yolk sac of the egg. If a tadpole drops off during this stage, it will not survive. At a rather advanced stage, they are ready to drop off. The male then immerses himself and the tadpoles in water and they float off independently. They are adults in about one year. Adaptations: It is thought that the bright colours are warnings to other animals that they are not fit to eat. The colours are not visible at night and the poison allows them to be diurnal rather than nocturnal like most other frogs. Their venom is located in the skin and is released on contact, attacking the neuromuscular apparatus of an enemy via the bloodstream. The practice of the male carrying the eggs on his back cuts down on the amount of time spent as defenseless eggs and tadpoles in waters that teem with predators. As a result, these frogs can make do with fewer eggs and thus spawn larger ones, which supply more yolk for each developing embryo. 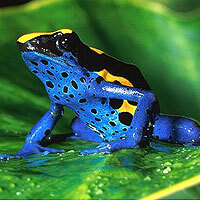 Threats: These frogs, due to their warning colouration, live a much safer life in the hazardous jungle than other frogs. However, they are over collected for the pet/zoo market. Also extensive jungle clearance destroys the humid understory they require. The common name of the genus indicates one use to which South American Indians put these frogs. The authority, Doris M. Cochran, describes this genus: " The Dendrobatins are the true poison murderers. The South American Indians used the cutaneous poison for their arrow tips long before white man's arrival. The Indians kill the frogs by impaling them on a stick and holding them over a fire. The heat causes the poison to drip from the cutaneous glands into a vessel in which it is kept while fermentation occurs. Finally the arrow tips are dipped in the liquid and are dried. A monkey or bird struck with such an arrow is paralyzed almost immediately. Small quantities of poison have little effect on larger animals or humans." Another use to which the poison is put is for "dyeing" green Amazon parrots. The green and blue feathers on the head and neck are plucked out and these places are rubbed with the poison, often simply with the living frog. This is repeated when the new, young feathers grow in. The result is that these feathers appear yellow instead of green. The Brazilians are partial to these "freaks" or "contrafeitos" and a considerable industry exists. (Amphibia and Reptiles - Gadow, 1968). References: Breen, John F, Encyclopedia of Reptiles and Amphibians, T.F.H. Publications Inc., Hong Kong. Cochrane, Doris M., Living Amphibians of the World, Doubleday Gadow, Amphibians and Reptiles, Weldon and Wesley, England Grzimek's Animal Life Encyclopedia Volume 5 Smith, H. Rucker, Amphibians and Their Ways, MacMillan Life - Nature Library, "South America"